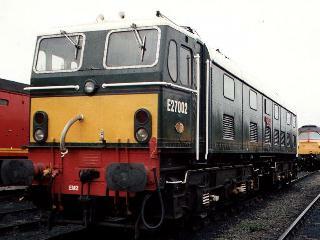 The major fund raising exercise to purchase No E27000 was probably the 'EM2 Farewell Railtour' of 14 June 1986. It is generally acknowledged as probably the greatest modern traction railtour of all time. It involved a huge amount of preparation, but that was amply rewarded on the day by the impeccable behaviour of over 400 British enthusiasts and the sheer enthusiasm of the NS. All four surviving EM2s, Nos 1501/2/3/5 were used, and the organisation of the photo lineups and various surprises (including a final triple-header) on the day really showed how a railway system should treat its most staunch supporters. Following the railtour the remaining EM2s were withdrawn by NS after 16 years loyal service for some very careful owners. Electra had clocked up 5,000,000 miles service in Holland since 1970, and was duly handed over to the EM2 locomotive Society on 10 July 1986. It was hauled with Ariadne (destined for Manchester) to Roosendaal en route to the UK at Harwich, and as a final gesture the NS reinstated No 1503 (E27004) to haul the two 'EM2s' for the Dutch leg of the return home. Sailing on the 'Cambridge Ferry', the same vessel that took the locomotives to Holland back in 1969, the two repatriees arrived at Harwich from Zeebrugge on 15th July 1986. They were removed from the ferry and taken to Parkeston Quay by 31252, where 1505 was placed in the 2035 Parkeston - Willesden for its journey to Manchester. 1502 was shunted into a safe siding until the following day. Wednesday 16th July saw 'Electra' transferred to Toton via Whitemoor and March, and the following day was worked to the Midland Railway Centre and parked at Butterley. Meanwhile, it had been decided to undertake restoration of the locomotive to BR green livery at the Midland Railway Centre (MRC). This would be a cosmetic restoration only, as Electra had already been invited back to Holland for its 150th Railway Anniversary celebration in 1989, and no alteration to the Dutch marker lights etc. could be made. While based at the MRC, visits by the locomotive were made to numerous open days still carrying NS livery, which was not dissimilar to the grey / yellow engineers livery becoming common at the time. By the end of 1987, it was decided that the Society needed fully covered accommodation to shotblast Electra back to bare metal ready for a full restoration. The West Yorkshire Transport Museum had then several rare vehicles stored in the ex-BR depot at Hammerton Street in Bradford, as they planned to reopen the Spen Valley Railway line with overhead catenary. Arrangements were duly made, and Electra arrived at Bradford on 28 June 1989. Most of our working members lived nearer to Bradford than the MRC, and that meant that not only was shotblasting complete by the end of July but the locomotive was primed and undercoated as well. It was unveiled in unlined Brunswick green livery at Basingstoke on 16 September and then spent most of the autumn touring the southern open day circuit before returning to Bradford for varnishing. Over the following winter and spring, lining out and varnishing was completed, and yellow panels added. After inspection at Hammerton Street by Dutch Railway officials the locomotive was pronounced fit for NS traffic again and left for Holland via Ilford Depot Open Day in May 1989. It crossed the sea for the third time on 24 May 1989, from Dover to Dunkirk, and after a 48-hour journey across France and Belgium, arrived back at Tilburg Works. The NS rebuild had left some bogie and roof fittings 'out of gauge' for BR, but after reinstating these few items she was energised at 1,500 volts for the first time in preservation on 1st June 1989. The NS were not too happy about the BR 'box' pantographs that had been reinstated, but these were quickly replaced and Electra was ready for a programme of mainline running. Between June and September 1989, the locomotive travelled 3,191 miles in Holland under its own power. This involved four railtours for the EM2 Locomotive Society, one Utrecht-Rotterdam CS service train, many movements of exhibits to and from Utrecht and the NSs own gourmet expresses. After a very successful tour Electra returned to Dover on 27 September. On returning to the UK, opportunities for running the locomotive were non-existent as no preserved line has yet taken the plunge with overhead catenary. 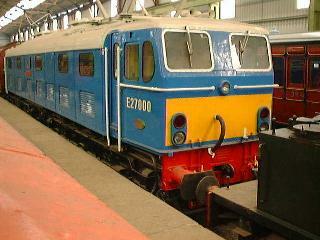 The following four years were based at Ilford Depot and on the southern depot open day circuit. In September 1993, 27000 was returned to public display at the MRC, via the Worksop open day. 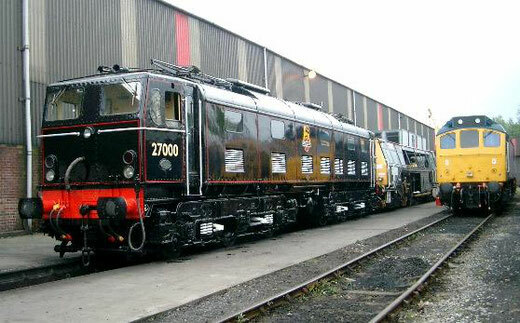 Since then, several visits have been made to open days in northern England, including a very memorable meeting with the NRM's EM1 No 26020 at Crewe International Electric Depot Open Day in October 1994. The first meeting of the two types of Woodhead electrics since 1969. By 1996, the BR green livery applied eight years before was beginning to show its age. As all its possible liveries were already represented in preservation, it was decided to take the bold step of painting her into BR electric blue. When three of the class were overhauled at Crewe in the early 1960s they received this livery and although Electra was not one of them, it was decided to be different. In the new colour she was exhibited at Tinsley open day in April 1996, and received favourable comments although several people took some convincing that the livery was authentic. Since then the locomotive has remained on display in the museum building at the MRC, and although ostensibly operational there is still no opportunity available to show her paces in the UK. A further return to Holland only needs the invitation, but with another fully operational EM2 No 1501/E27003 already there, owned by a group of NS staff, such a move would not really be viable. It might be argued that the preservation of a locomotive with no foreseeable running potential is a waste of time, but the Society would argue that Electra deserves her place in the preservation world on historical basis alone - Britain's first mainline electric express passenger locomotive (if you exclude the stillborn number 13 of the North Eastern Railway), and with a history more interesting than the average.